Visit Windansea Beach, a spectacular La Jolla beach for surfing, watching romantic sunsets, and capturing some great San Diego beach photos. 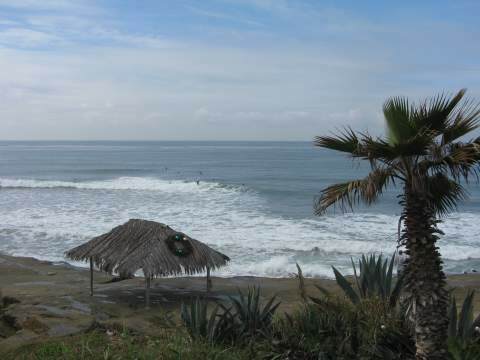 This is mostly a local SD spot, with interesting sandstone rock formations and rough waves. Windandsea Beach is considered one of the most beautiful beaches in Southern California. 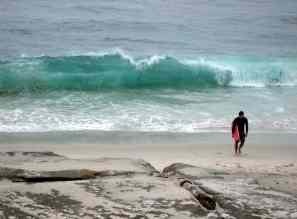 Windansea beach in La Jolla, San Diego CA, offers spectacular scenery, but the name says a lot. 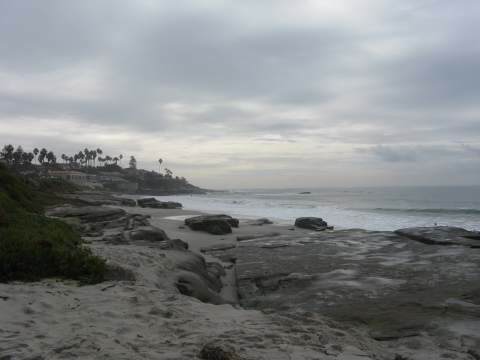 Lots of wind and sea at this La Jolla beach, but if you are looking for a wide sandy beach, go for La Jolla Shores or Marine Street beach instead. Windansea Beach has been a popular San Diego surfing spot 1940s and a gathering spot of the Windansea Surf Club since the 1960s. 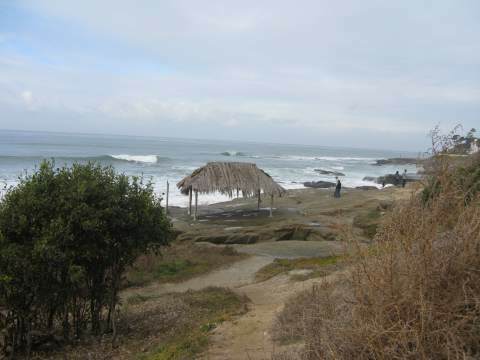 The frequently photographed shack on the beach, built by surfers during World War II, is now a San Diego Historic site. For some locals, this is their favorite beach. The surfing is great to watch, but it it crowded and dangerous if you don't know what you are doing, as there are many rocks along the shore, and the waves are rough. Forget entering the water in a bikini too, as you will either lose it or get scraped on the coarse sand or rocks. The rock formations make it a striking backdrop for beach photography, and many San Diego beach wedding photos or romantics pics are shot here. Low tide is the best time to visit, as more rocks are exposed. 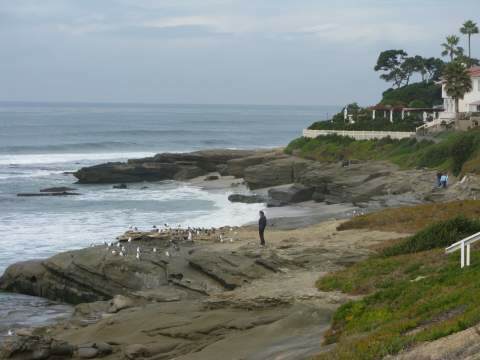 This is one of the most romantic beaches in San Diego, with some semi-private spots hidden between the large sandstone rock formations. I love this beach at low tide, as there is more room to walk around, on the sandy beach toward the south or the rocky area to the north. This is not recommended for small children, as the rocks can be slippery and the waves are strong. Sunsets at Wind n sea beach are spectacular, another reason this a great romantic San Diego beach. Parking: Small free parking lot with 18 spaces. Other free but limited street parking available. 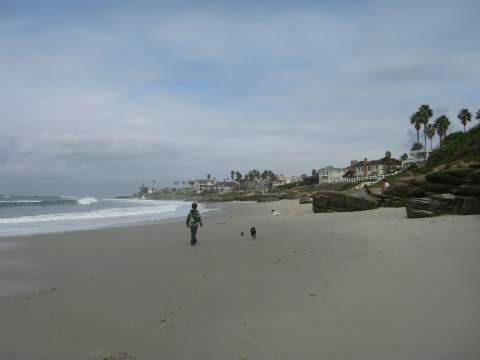 Getting There: Short walk to the beach from parking areas, and from this La Jolla neighborhood, as this is mostly a locals beach. Things to Do: Surfing, bodyboarding, beach photography, watching California sunsets, romantic strolls along the rocks, explore rocks at low tide. Things to See: Surfers, young people at the beach, sunset over the Pacific Ocean. Facilities: Not much. Trash cans, park benches and small grassy area. No restrooms. No beach firepits. High Tide Access: This beach is best at low tide as you can explore the rock formations. If you are surfing or body boarding, watch out for the rocks. Things NOT to Do: No inexperienced or young swimmers in the water, no alcohol, no glass containers, no beach fires, no smoking, no littering, no disturbing noise, no overnight sleeping, camping or parking. Disability Access: No wheelchair access to the beach, but nice views from adjacent sidewalk near disabled parking. Hazards: Rip currents, strong waves, sandstone rocks, coarse sand. Directions to Windandsea Beach from the north - go south on Interstate 5, west on La Jolla Village Drive, left on Torrey Pines Road, right on Pearl Street, left on La Jolla Boulevard, then right on Nautilus and head to the ocean. Directions to Windansea Beach from the south - go north on Interstate 5, go west on La Jolla Parkway, continue on it as it becomes Torrey Pines Road, right on Pearl Street, left on La Jolla Boulevard, then right on Nautilus and head west to the Pacific Ocean.